A mysterious group of pirates called The Black Ship Gang appears in the Great Edo Harbor and begins wreaking havoc across the land. Join Goemon and his friends Ebisumaru and Sasuke as they battle to save ancient Japan from the clutches of the evil gang, and rescue their fellow ninja, Yae, from the gang’s clutches. 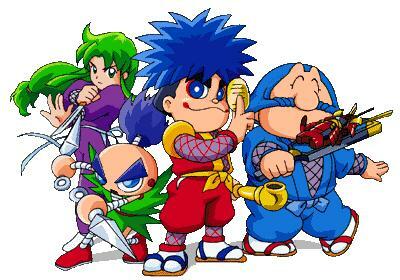 Originally released in 1998, Mystical Ninja starring Goemon is an action role-playing game featuring three different characters to control, each with unique skills. Fight your way from Karakuri Castle through bustling villages, all the way to Skull Island. Visit towns and question the inhabitants for clues. Buy items to aid your quest, and solve brain-teasing puzzles to find Yae and defeat the pirates. Gear up and join an elite Special Forces unit in Heavy Fire: Special Operations 3D, an arcade-style on-rail shooter for Nintendo 3DS. Choose from three character profiles, each with unique attributes, and use a combination of brains and brawn (but mostly brawn) to blast your way through a variety of dangerous ground, vehicle and air-based stages. And if you’re really feeling trigger-happy, you can earn additional points by blowing up the environment. Each victory sees your military rank rise, earning you increasingly powerful and upgradeable weapons. You’ll need preternatural reflexes and a never-say-die spirit to restore peace in the ever-volatile Middle East. When the smoke clears, will you be a Special Operations legend? Ever had a dream of owning you own bookstore? Now you can! Bookstore Dream is a simulation game that allows you to manage your lovely bookstore. Get connected with publishers and put the best books on your shelf! Be sure to keep stocks at a good level when demands go up! If you do everything right you will become a well know brand in the community! Watch for a Chance to Win – Watch this week’s episode of Dinosaur Office on Nintendo Video to enter for a chance to win a special episode of Dinosaur Office: The Remix!